U.S. stocks closed higher on Friday, retracing most intra-day gyrations associated with Donald Trump’s presidential Inauguration Day speech, which many investors noted as overly protectionist. Yet Trump’s first speech as president also included a renewed pledge to build new roads and bridges. The fourth quarter earnings season is underway, with early profit reports topping analysts’ forecasts, getting large caps off to a strong start, while sales beats have been weaker. While still very much preliminary, fourth quarter earnings “beat rates” are at the high end of their historical range, but sales beats are down from last quarter and below their long-term average. Financial shares, the top performing sector from election day to year-end, climbed on Friday, but retreated 1.6% for the week. A two-week rally in small cap shares ended as the Russell 2000 Index fell 1.5% over the four-day holiday-shortened week. For the week, the Dow Industrials fell -0.29%, the S&P 500 dipped -0.13%, while the MSCI EAFE (developed international) lost -0.47%. 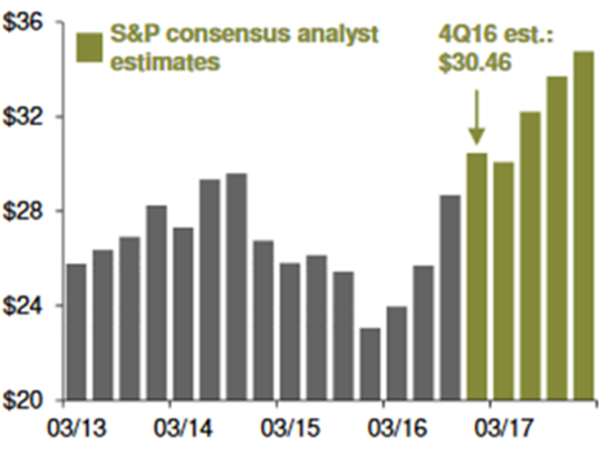 S&P forecasts 4Q earnings growth of 32%, a rate not seen since late-2010 when earnings were rebounding in the wake of the financial crisis. JP Morgan says that the anticipated success of 4Q earnings and the realized success of third quarter's earnings stem from similar drivers: stable commodity prices, rising rates, and fading dollar strength. For financials, low rates and increased regulatory burden have put pressure on both revenues (downward) and costs (upward) in recent years. However, Fed commentary suggests rates are headed higher, and the prospect of regulatory and tax reform under the new administration has assuaged investor concerns and ballooned earnings expectations. For energy, the supply/demand imbalance that led to a decline in oil prices is gradually correcting itself, and the OPEC agreement to cut production has led prices to rebound. That said, while the tide appears to be turning, investors should take these forecasts with a grain of salt. Analysts are often too optimistic, and a tight labor market should put upward pressure on wages. Without a corresponding increase in revenues, higher wages could lead to margin compression and earnings weakness, a development that investors should remain cognizant of looking forward.